You knew that being a freelancer meant you’d have to work at it. That there’d be tough times and learning curves. That it wouldn’t always be easy. But jeez, you didn’t know being a freelancer could be this hard. Freelancing was supposed to be the answer to your dreams. Live your life according to your own schedule, with no one telling you what to do, and make money doing what you love. You could even work in your pajamas if you felt like it. At least, that was the dream. The reality is a ton of stress, struggle and and sixty-hour workweeks. But there’s a better way: become an Unlimited Freelancer. Over the years, we’ve learned a superior brand of freelancing that cuts down on the busywork, that brings in better clients and earns higher rates – with plenty of free time left over so we can enjoy the sunshine and our families. We’re living the freelancer dream – and you can too. That’s only a small fraction of what’s in this jam-packed 200-page resource. And yes, you read that right: 200 pages of insider information on how to become a happier, richer, better and generally awesome freelancer. It’s time to up your freelancing game, and this guide will take you there. 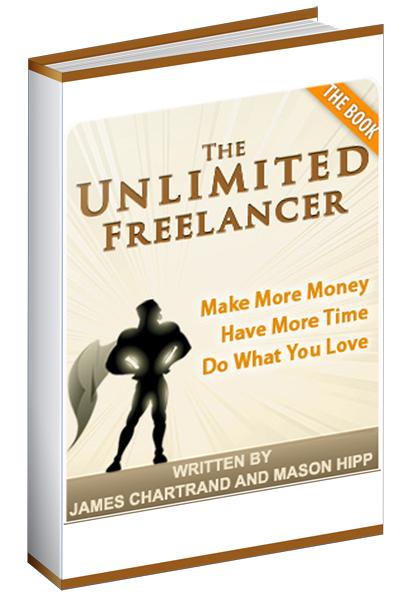 The Unlimited Freelancer, written by James Chartrand and Mason Hipp, is available from Freelance Folder. Click the banner below to be redirected to Unlimited Freelancer book page where you can grab your copy today.